The NU Lady Bulldogs ended UP’s Final 4 bid on Sunday. Arvin Lim, ABS-CBN Sports. 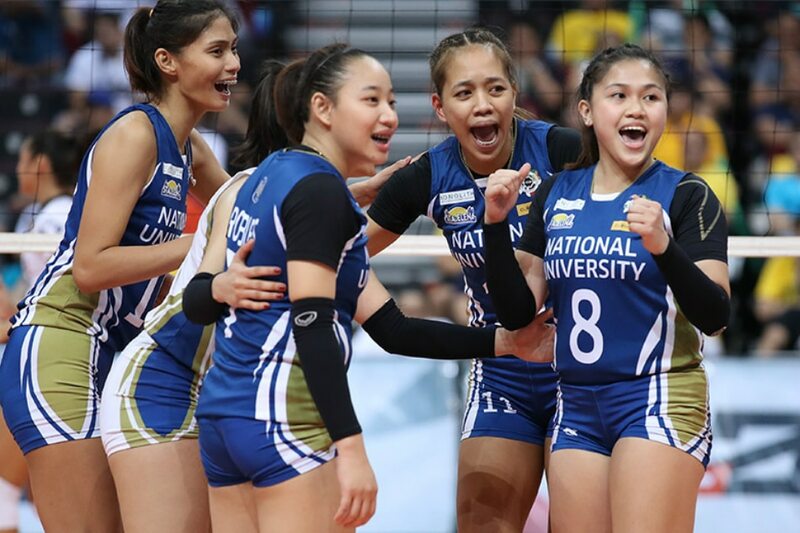 MANILA – National University did not head into the Mall of Asia Arena on Sunday intending to oust University of the Philippines from the race to the Final 4 of the UAAP Season 81 women’s volleyball tournament. The Lady Bulldogs, after all, were already out of the semifinals race, and simply wanted to give a good account of themselves in their final matches of the elimination round. In doing so, the Lady Bulldogs dealt the Lady Maroons a costly loss, as they secured a hard-earned 25-21, 26-24, 17-25, 23-25, 17-15 triumph in their penultimate game of the season. The result dropped UP to 6-7, putting the Final 4 out of their reach. “With this result, masaya ako kasi may lumabas ulit na character doon sa team namin,” said NU head coach Norman Miguel, whose young team has now collected four victories in Season 81. “Sabi lang namin basta yung last two games na to, kung manalo, manalo. Kung hindi, basta may best performance tayo. And this time nanalo kami, sobrang happy,” he added. Miguel and his team were surprised to learn that their victory had an impact on the Final 4 picture, and they insisted that they did not set out to play a spoiler role to the Lady Maroons’ dreams of making it to the semifinals. UP needed to win on Sunday just to stay alive in the Final 4 race. The Lady Bulldogs will carry that same mindset to their final game of the season — a date against University of Santo Tomas on April 27. Again, National U has nothing to lose, but the Tigresses will be determined to win that game so as to keep its bid for a semis bonus alive. That game against UST caps a “roller-coaster” season for National U, which saw them lose rookie setter Joyme Cagande to a knee injury in their very first game. They pulled off some surprises — notably, they swept UP in the elimination round — but also labored through some difficult defeats.